Beautiful 5+ acre property on the Androscoggin River with easy access down in with canoe/kayaks. 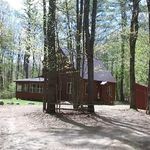 Property is privately situated only 5 minutes to the Bethel Village and Sunday River. Very well maintained saltbox style home with new 3 season porch, finished basement and screened in deck. On the main level you will find a centrally located brick fireplace, spacious kitchen with ample storage, open living room and dining room, 2 bedrooms and a full bath. Sale includes build-able waterfront lot to keep or sell!